Label : Title for the application within the menu. You type a fixed title or use the Scriptcase language system to create lang variable for these names, according to the languages used in the project. Link : Here you have to enter the application name that will be linked to the menu item. You can also click search button and select from the application list. This link can also be an external URL. Hint : Descriptive text that helps the user to identify the application. It is an optional field. Icon : Image that will be displayed as an icon in the menu item. The user can click the search button to select the image from the Scriptcase Image Manage. It is an optional field. Active tab icon : Image that will be displayed as an icon in the menu item when active. The user can click the search button to select the image from the Scriptcase Image Manage. It is an optional field. If you leave it blank Scriptcase adds a default image. Inactive tab icon : Image that will be displayed as an icon in the menu item when inactive. The user can click the search button to select the image from the Scriptcase Image Manage. It is an optional field. If you leave it blank Scriptcase adds a default image. 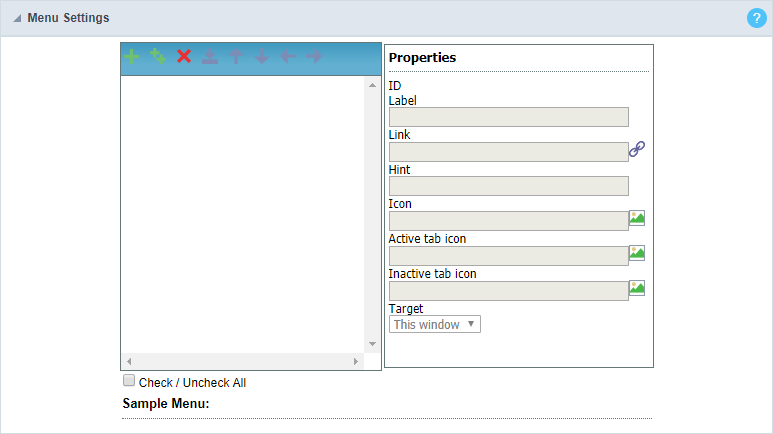 Target : This option sets how the application will be displayed, it can be target as: Same window, Another window or leave (it will log the user out from the system). Insert Sub-Item : This option add sub-items to the menu, you might select the main item before to add the sub-items within the selected main item. You can also manage the sub-item position using the arrows. Remove : This option deletes the item/sub-item, you might select the items before and then remove. Import applications : You can use this option to call an application to attach to the item. It will open the project application list. Move up : This option allows you to move up a menu item or sub-item. Move down : This option allows you to move down a menu item or sub-item. Move left : This option allows you to move a menu item or sub-item to the left. You can use it to organize the menu hierarchy. Move right : This option allows you to move a menu item or sub-item to the right. You can use it to organize the menu hierarchy. Importing the applications is easy and fast. Allows the user to select from a list of application, the application the desired to import. After selecting the application, you just need to organize the levels of the menu, using the positioning buttons. After selecting the application, the link property will receive the application name. View the image below. Application Import Interface.